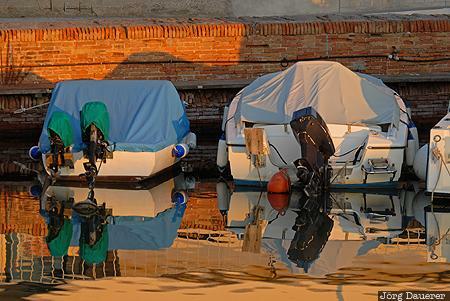 Small boats in the harbor of Castiglione Della Pescaia and their reflexions in the Fiume Bruna illuminated by warm morning light. Castiglione della Pescaia is at the coast of the mediterranean sea in the province Grosseto in the southern part of Tuscany, Italy. This photo was taken in the morning of a sunny day in October of 2009. This photo was taken with a digital camera.